Orlando’s city council approved an agreement Monday afternoon that will help make it possible for Mad Cow Theatre to establish a new home on the second floor of 54 W. Church St., the downtown retail space that was once home to Hooters. The council voted 6-1 to okay the agreement between city and the landlord, the Dutch lender FFWO, LLC, to allocate about 9,000 square feet for the arts. Plans are for Mad Cow to sublet that space from the city for $1 a year for 75 years. FFWO controls the 32-story residential/commercial complex at 55 W. Church St., as well as 54 W. Church, the two-story retail complex across the street. 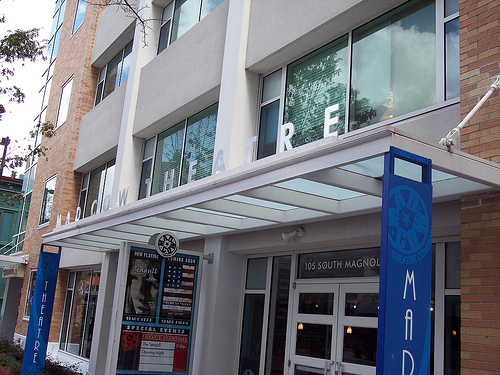 Assuming the sublease between the city and Mad Cow is approved, that agreement would allow the theater company to move from its current home on South Magnolia Avenue to the West Church Street building, where there would be room for two slightly larger theaters, along with a lobby and considerable more space backstage. The new theater lobby would face Church Street, and there would be higher ceilings in the theaters and considerably more space backstage. Mad Cow’s current theaters have low ceilings and almost no backstage. The agreement signed today requires the city and the developer together to contribute about $800,000 toward the theater’s build-out – around $100,000 from the city and the remainder from the developer. Mitzi Maxwell, the theater’s general manager, says that total build-out costs may be as much as $1.2 million. Henry Maldonado, former general manager of WKMG-TV and now president of Enzian Theater, is heading Mad Cow’s capital campaign. Tim Lemons, managing principal of L2 Studios and the architect who designed Mad Cow’s current home, also would design the new space. Maxwell hopes to have moved into the new theater by the beginning of the 2011-2012 season. Founded in 1997, Mad Cow has been on Magnolia Avenue since 2003. That space has proved challenging, partly for the split design of its larger theater but more often for the sizable rent – about $100,000 a year – and for poor maintenance, which has resulted in a flooded basement, lack of air conditioning in the theater, poorly kept restrooms and other problems. Today’s agreement is expected to cost the city about $27,500 a year in operating costs. Phil Diamond was the only council member to vote against the plan. Plans for the 55 W. Church Street development – encompassing the building at 54 W. Church St. that was once part of Church Street Market – began in 2000 as a condominium and commercial site. When the bottom fell out of the condo market in the late 2000s, the 55 W. Church building eventually was turned into rental apartments. According to today’s agreement, the city is interested in helping Mad Cow to build a home on West Church Street to encourage “diverse cultural activities” downtown. “Live theater is a high-priority activity generator that is considered a destination activity,” the agreement states. In other words, theater will bring people downtown. Maxwell said that she expects the sublease between the theater and the city to be signed relatively soon, perhaps in the next few weeks. This entry was posted in Orlando theater, Performance space, Regional theater, Uncategorized and tagged mad cow theatre, Orlando. Bookmark the permalink. YAY! Good for the City.. KUDOS to MAD COW!!! MOO ON! Fabulous news! The fabulous productions of Mad Cow will now have a fabulous space! Hope there’s fabulous parking nearby also. . . Many thanks to the city and to the landlord. Congrats to Mad Cow! Big exciting news! Let’s hope the new space brings both artistic and commercial success to a deserving theatre company. This is great news to begin a new year! Congrats Mitzi and all those hard working talented directors, actors and crews!!! Congratulations! Awesome news for Mad Cow and for theater in Orlando! Hallelujah! Great news indeed, can’t wait to get on that new stage!! Great to see the City recognizing the importance of the Arts. I am happy for ANY theater to exist and be presented downtown. However it needs to be mentioned that this sweetheart deal for Mad Cow from the city should carry a requirement that actors be paid a decent wage and that they be paid in a timely manner. One would hope that sans a monthly rent bill, Mad Cow might now be able to pay their actors during the same weeks they perform rather than making them wait as long as two months after performing to be paid, which is now the unfortunate norm at Mad Cow. I would encourage actors who give of their talent at Mad Cow to band together and insist on timely payment (at the least) in light of this deal. Michael, while we artists who give of our talents to Mad Cow appreciate your concern, we are more than capable of taking care of these matters ourselves. I’m fairly certain that anyone who has participated in a Mad Cow production in the past did so to feed their passion for theatre, not their wallet. That being said, to the best of my knowledge Mad Cow has always honored financial obligations, and made it a point to pay artists even in the face of financial hardship. I can also assure you that should Mad Cow’s “sweetheart deal”(earned through 14 years of sacrifice) result in greater revenue, artist will certainly be beneficiaries. Mad Cow produces good theater, but they produce the shows in lousy theaters. I always hate seeing a play in that bisected auditorium that separates the audience like the Hatfields and McCoys. (Or maybe that should be the Capulets and Montagues.) Whatever. I’m very excited that the Cow may mooove to better pastures. This is terrific! Congratulations Mad Cow! Kudos to Mitzi and the Mad Cow folks – this is wonderful news!!!!! btw: I chuckled over this — used to be a “Hooters” now a “Mad Cow”. Too much.